William H. Knight was my maternal great-grandfather, the son of Nathaniel and Nancy (Macmillan) Knight. On 14 May 1862, he enlisted in Barnes' Battery of A. Leyden's 9th Georgia Artillery. He was captured at the surrender of Cumberland Gap, Tennessee, on 9 September 1863. From there, he was taken to Camp Douglas outside Chicago, where he remained until the end of the war. Here is his story. It doesn't take very long for the ﻿budding﻿ genealogist to learn the value of a good Research Calendar. At first, all of us believe that we'll never forget which books we've searched and why we searched them. But as we gather census recor﻿ds, deeds, wills, and other papers, and add more names to our family tree, sources become a distant memory. With no record of what we've already searched, we're doomed to waste valuable research time digging up the same records we discovered months or years earlier. I've developed a simple research calendar that has worked well for me. It even has a hyperlink column that enables you to add a hyperlink to a scanned image or the document containing your transcription or notes. 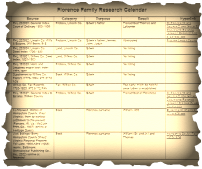 You may look at a sample research calendar, or download it as an Excel file or in pdf format for convenient printing. Cite Your Sources ﻿As You Go! You don't have to be a professional to use professional standards! And the earlier you begin, the better! Most of us are preserving photographs, family traditions, and all the other documents that tell the story of our family's history, in the hope of passing them on to the next generation. Without source citations, how are they to know if any of the information is true? Take the time, from the beginning, to document your work, and you'll be proud of the collection that you pass on to your descendants. A word of caution . . . when you copy documents, write the source somewhere on the front of each page so that the information is not lost on subsequent copies. For further information on source citation see Elizabeth Shown Mills' article, "Citing Your Sources" (click here), and Amy Johnson Crow's article, "Citations On the Source" (click here), which appear in the Skillbuilding Section of the Board for Certification of Genealogists' (BCG) website. Get to Know the FAN Club! From the beginning of my genealogical education, my instructors have based complex problem-solving on expanding the search beyond the immediate family to include friends, associates, and neighbors. Now, Elizabeth Shown Mills has articulated the principle in a way that we can easily understand and remember . . . the FAN Club. I would never have found a 1787 death record for William Rand of Chester, New Hampshire, if I hadn't expanded the search to include the personal papers of local surveyor Stephen Chase. I would never have found the full description of my great-great-grandfather Aaron Knight's Revolutionary service if I hadn't expanded the search beyond a surname search of the index to include all pension applications. Although he did not apply for a pension himself, he did testify on behalf of a fellow soldier. It was in that fellow soldier's pension file that I found a full description of Aaron's service. For further information on this amazing research technique, check out Identity Problems & the FAN Principle and The Historical Biographer's Guide to Individual Problem Analysis.